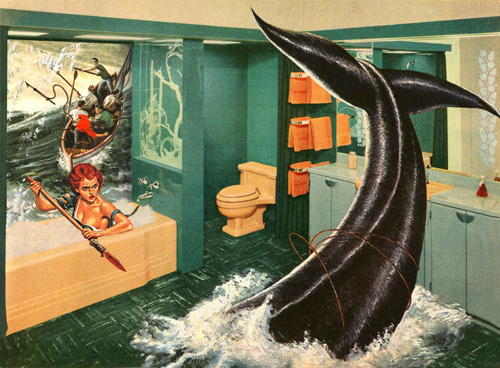 The salty sea meets the scrubbing bubbles in this week’s io9 writing prompt. Here’s the picture they supplied, followed by the story I wrote in response. Tiphannie claimed the most kills of any living female transdimensional whaler, and she did it all from the comfort of her own home. She had built herself a house in the path of their migration route. She kept krill on hand to lure the creatures to the surface, and her heart raced when she felt the subtle rocking just before they punctured the membrane of her reality. Since they were now technically trespassing, there was nothing legally preventing her from harpooning the beasts. Selling the meat of a single whale could support her for months. So it was a sad day when the species was declared endangered. It wasn’t her fault. Her actions had been a drop in the proverbial bucket, nothing on the scale of the genocide former centuries had launched on their dimensionally-bound cousins. So many hundreds of the creatures had escaped her. So many days had gone without a single harpoon thrown. That was the point. That was the sport of it. She had decorated her entire house with nautically themed imagery and walked around acting like she had a peg leg, muttering to herself like the salty dog she knew herself to be, but the eye patch had been a mistake. She had whacked her knees into door frames and tripped over things outside her new field of vision enough times to learn that the pirate voice and hobble was plenty. The best spot in the house to hunt from was the bathtub. That was the most compatible with the dimension the whales occupied. If she made enough turbulence, she could convince herself that she was in her own little tempestuous sea, adding to the effect, and when the whales passed through her tile floor, she ran less risk of ending up on top of them, or worse, partially dematerialized in their path. She cared for the beasts, not just because she had been living off their meat for years. She respected their strength, their grace, and their ability to cross to a new dimension without completely dematerializing from the old one. But she couldn’t concentrate on her work. She kept thinking any one of the creatures she killed might be the tipping point from which the species would never return. So she packed up her harpoons. She put her house up for sale “as is.” She moved back with her parents in Vallejo and got a job waiting tables at the local Long John Silver’s.